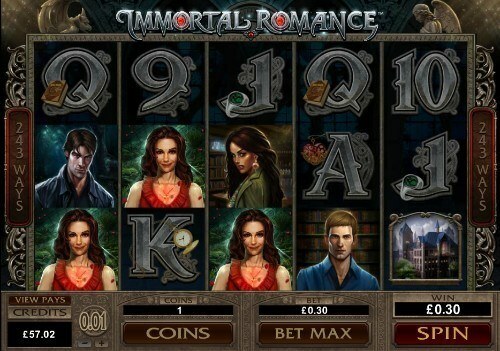 Immortal Romance is a 5 reel, 243 ways to win slot game with a 96.86% RTP. This slot is packed with progressive Free Spins bonus rounds. Immortal Romance is a story about Michael, Amber, Sarah and Troy, it is a game that features 5 reels and 243 ways to win. The game was designed to keep you captivated because it is breathtaking. Immortal Romance online slots UK game that will give you an insight into being in the dark and fascinating vampiric love! As it is already known, the design of a game is as important as other features of the game. Micro gaming Systems did not disappoint when considering the graphics and design of Immortal Romance. The vampiric theme was carried along all through the game. You have the imagery tingling the spine and the dark gothic symbols featured in the game, coupled with a strong storyline make the slot games remarkable. Immortal Romance 243 ways to win slot game developed by Microgaming, which is supply award-winning online gaming software to the leading operators worldwide. Games similar to Immortal Romance include Bitten slots, Dark Thirst UK Slot and Blood suckers online slot. Everything about Immortal romance is gothic. Even the playing cards (A, K, Q, J, 10 and 9) featured in most online slots are drawn with a gothic mind. The picture card symbols in the game were lavishly decorated with dark objects. Some symbols pay greatly while some will only give you what could be termed as a stipend. For instance, the symbols that will award you immense payouts are the symbols of Sarah, Troy, Michael, Amber, a letter and an old house. The wild symbol in the game is depicted by the Immortal Romance logo. The scatter symbol is represented by a lion’s head. Not to be forgotten is the fact that the game as a very good return to player (RTP) ratio. The RTP ratio id 96.86%, which is very good for punters who are willing to play the Immortal Romance online slots for real money on Money Reels. Before you can start spinning to win in the game like the case is in most of the online slots, you have to choose the stake size you want. Since the game features fixed pay lines you have a very low minimum bet of 30p, which gradually increases till it reaches a maximum of £300. Throughout the game, all the pay lines (243) are active by default. You have the option to stake up more than 1 coin for each spin, in fact, the number of coins you can bet ranges from 1 through 10. The coins button is there on your playing screen (situated at the bottom of the screen) to select your bet amount with. The moment you have set your stake amount, you are allowed to start spinning in the Immortal Romance online slots using the spin button. If you wish to stake the possible maximum amount in the game, the bet max button is also available for you. It should be noted that clicking on the bet max button will stake up the maximum 10 coins for that spin. Before you can be awarded winnings in the game, you must have the required combinations of symbols. The play card symbols (A, K, Q, J, 10 and 9) are the ones that return little payouts. So, having the right number of the playing cards on the reels with only return little payouts. The symbol that pays the highest is the Immortal Romance logo. This symbol is also the wild symbol for the game, and it’s capable of replacing other symbols apart from the scatter symbol (the lion’s head) to complete winning combinations. If you are lucky enough to land 5 of the Immortal Romance logo (the wild symbol) on the reels, you will receive a massive payout of 15,000 times (15,000x) the coin value staked. Also, if the wild symbol has to come in and replace another symbol to make a win, the amount won will be doubled. Apart from making winning combinations with the featured symbols, bonus games can actually be initiated by punters if the scatter symbol is landed, and there are many levels to the bonus feature. Basically, the game is all about spinning but divided into 4 levels. Initially, you will only have access to the first level, then you can gradually unlock the other levels, and the rewards for each of the levels are different. For the first level, you will be awarded 10 free spins and a 5 times (5x) multiplier. In the next level, vampire bats are introduced. The vampire bats have the power to change symbols to extra 2 times (2x) and 3 times (3x) multipliers. The third level introduces the rolling reels. And the final level (the fourth level) features the wild vines. The wild vines are capable of transforming symbols into additional Wilds. Since it has been mentioned that the rewards increase for each of the levels, the free spins available for each level increases, and you can get up to 25 free spins at the fourth level. In addition to that, you may even win a whooping sum of 3,645,000 coins, which means a jackpot! Amber: The amber symbol will give you 10 free spins, and your winnings will be multiplied by 5. At the level, you can reactivate free spins. Troy: you will be awarded 15 free spins at this level and the vampire bats feature will be activated. Symbols are tuned to 2x or 3 x multipliers randomly at this level. Michael: You will be awarded 20 free spins at this level and the rolling reels feature will be activated as well. At this level, your winnings can be multiplied from x2 to x5. The rolling reels could award you multiple successive wins. Sarah: The final level awards 25 free spins and the wild vines feature comes up at this level. Not to be forgotten is the wild desire feature, which is capable of turning 5 reels wild.